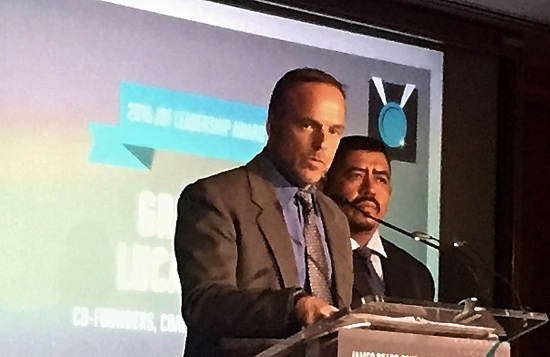 CIW honored with 2016 Leadership Award by James Beard Foundation at moving ceremony in NYC! 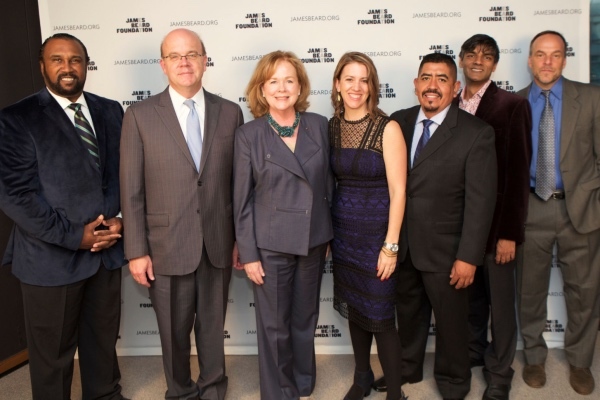 The CIW’s Lucas Benitez and Greg Asbed (third from right and far right, respectively) join their fellow Leadership Award honorees, from left, John Boyd Jr (President, National Black Farmers Association), Rep. Jim McGovern (Congressman, Massachusetts), Anna Lappe (Founder, Small Planet Institute), and Raj Patel (author, activist, academic). James Beard Foundation President Susan Ungaro (third from left) joins the honorees. Photo by Clay Williams. Last week, at a spectacular ceremony in New York City’s historic Hearst Tower, the James Beard Foundation presented its prestigious 2016 Leadership Award to the CIW for its “innovative work in forging a new human rights model in the food industry supply chain.” The CIW had the honor of being introduced by human rights leader Kerry Kennedy, and joined an illustrious line-up of fellow awardees that included longtime CIW allies Raj Patel and Anna Lappè. Lucas Benitez: We would like to thank the James Beard Foundation for this tremendous — and tremendously humbling — honor. Of course, you see us here on the stage tonight because someone has to receive the award and this stage doesn’t fit the scores of colleagues with whom we work each and every day to build and run the Campaign for Fair Food and the Fair Food Program, not to mention the thousands of CIW members who have fought for over two decades for their own fundamental human rights, or the tens of thousands of consumers who have stood shoulder to shoulder with farmworkers in the long and often frustrating battle for those rights. Greg Asbed: … The Fair Food Program is just that, a new paradigm in the world of human rights and social responsibility. It is unique, and uniquely successful, for two key reasons — first, because workers, the very workers whose rights are in question, participate on each and every level of the program, from drafting the code of conduct to monitoring compliance with the code every day in the fields; and second, because the Fair Food Program is what we like to call “enforcement obsessed”, with multiple layers of monitoring and meaningful market consequences for growers who violate the code and refuse to correct those violations, it is designed to achieve not just the enforcement of human rights in the breach, but the prevention of human rights violations altogether. So, thank you for this award on behalf of all the thousands of people who have fought to make the Fair Food Program a reality, and we promise to keep making you proud as you watch this exciting new paradigm for protecting human rights in the 21st century continue to grow in the years ahead. All in all, it was an exciting day and an unforgettable evening for the CIW, a gathering that highlighted the growing union of the food justice sector with the broader food movement that holds untold promise for the future of food. We are beyond proud to be honored with so many great friends and leaders, and extremely grateful to the James Beard Foundation for including us in such a wonderful event. The “Behind the Braids” Northeast Tour takes New York by storm! Northeast “Behind the Braids” Tour heads north to Providence, Boston!